The worship leader will find it easy to create the perfect song set for each service, using the song selection, searching and printing tools, click-to-play chords and instant transposition. The audiovisual team will present the music and spoken word clearly and beautifully, using the powerful projection tools, visual paging, scripture projection, announcements, multimedia playback, and even a countdown timer. Visit our download page and get the installer. You get a complimentary 60-day trial with all features fully enabled. You can later unlock it permanently with no additional downloads! All Worship LIVE! purchases now include a complimentary 3-month membership to DelicateFade, a great resource for finding your favorite worship guitar tabs and chord charts. Worship LIVE! now searches for and automatically imports songs directly from the DelicateFade database - this could save you hours of work finding chord sheets for Sunday mornings! Pricing For a complete evaluation, just ask us for a 60-day unlock! Purchasing details can be found here. Various packages including add-ons are also available (compare the versions here). 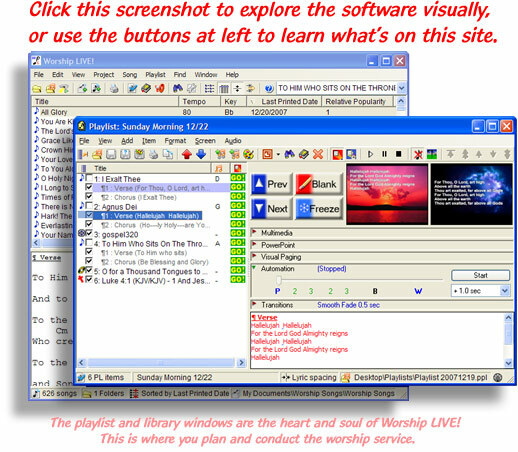 You won't find such a comprehensive worship software package at any similar price, anywhere! This software has been tested against Windows 7!